With the exception of All Nippon Airways, all foreign carriers dock at Terminal 1. It was my first time there. 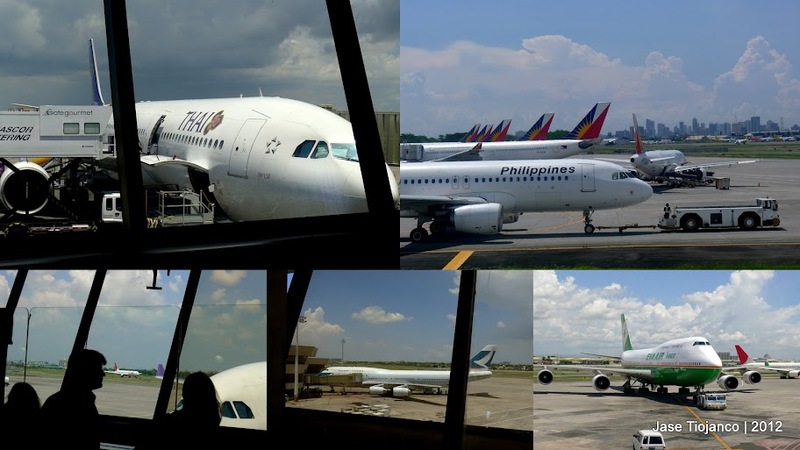 At last, I saw what the negative buzz around the Manila International Airport T1 is all about. My sister and her boyfriend Arman brought me to the airport. The traffic going to the terminal was crazy! Three hours before departure was my target but I arrived there a quarter past 11. Before entering the terminal, I thought that the check-in queue for Thai Airways wouldn’t be long. I was wrong, it was very long. After more than an hour, I was still in line. Apparently, some Overseas Filipino Workers fly Thai to their destinations in the Middle East. I was waiting in line for more than an hour. There were more than five check-in counters dedicated to Thai Airways economy passengers, and another three for those flying business-class. Due to the sheer number of people in line, they opened one of the three counters for business-class to the rest. After having my luggage checked in, I paid the terminal fee. Ugh, unnecessary hassle! Good thing that the fee would be soon included in the airfare. I wonder where the terminal fee goes? Thankfully, the terminal fee is now just 550. By the way, as I have mentioned, it was my first time inside Terminal 1. In my opinion, the terminal isn’t that bad. It could use some improvements but it’s nowhere as bad as how people say it to be. The check-in area needs a lot of sprucing up though, the check-in counters were horrendous. Past the terminal fee counters, everything was passable. Puwede na. Not that I’m tolerating that mentality, the terminal should really go a major renovation to keep up with the rest in the region. The terminal is what it is — an airport terminal. Nothing else to do here but wait for your flight. The food choices are limited, as in there was only one concessionaire in the departure lounge. When I got hungry, I had no choice. To be fair though, the food I bought there was quite good. Lasagna for lunch. I only had a really light breakfast before heading to the airport and after waiting for more than an hour to have my luggage checked-in, my tummy was already grumbling. There was construction going on and I do hope that things would be better once the works are done. Since there was nothing much to do in the terminal, I resorted to spotting planes to kill time. I saw planes from PAL, Cathay, EVA, and JAL. 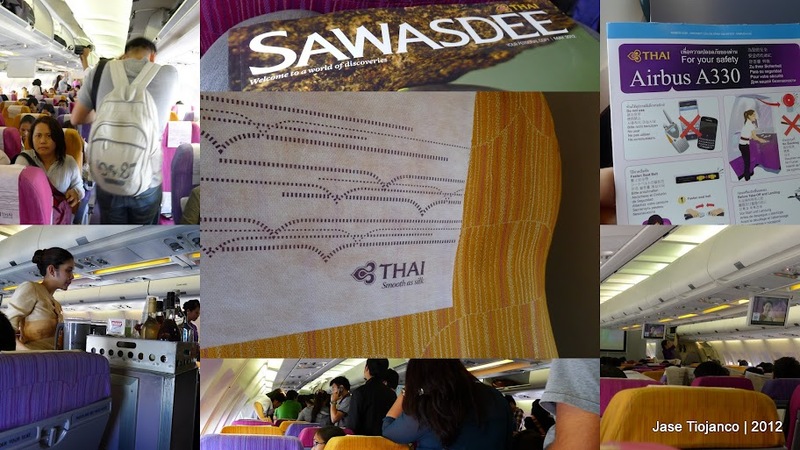 Of course, I saw the Thai Airways plane that we’d be riding to Bangkok. Minutes before the clock struck 1, it was time for boarding. I prepared my passport and boarding pass then headed to the gate. Boarding pass and passport, check! If you’d notice, my seat is 70A. Yes, it’s a window seat! I was really excited when I received my boarding pass since I love sitting by the window. The EVA Air 747 is taxiing for take off. The flight took three hours. As I have mentioned, it was my first time to ride a foreign carrier. Thai Airways lived up to its tagline, Smooth as Silk. Their service was impeccable. Right after takeoff, the flight crew immediately handed out warm towels for us to use to freshen up. The flight crew, by the way, were extremely nice and accommodating. I also liked their uniform which had hints of Thai art. I do hope PAL does the same thing because it’s a way to promote our culture. Drinks, including alcoholic beverages, were always being served. Around an hour and 30 minutes into the flight, the in-flight meal was served. I had a chicken dish which was very good. In-flight meal from Thai Airways. The tablet served as my review-buddy in the entire duration of the flight. I was going through my notes on Netezza thousands of feet up in the air. Geeky, yuck. Roughly half an hour before landing, the flight crew started handing out arrival cards. I filled up the card using the nice pen given to me by IBM ASEAN. Arrival Card. I can smell Bangkok! HAHA. Peeking out of the window, I could see vast fields. It was such a pleasant sight, totally different from the views one would see when approaching Manila International Airport. Suvarnabhumi Airport. It’s really big! We arrived in Bangkok later than expected. Why? Because of the airport congestion in NAIA. We took off thirty minutes later than scheduled. Taxiing to Suvarnabhumi Airport Terminal. Thai Airways 747 docked at Suvarnabhumi. 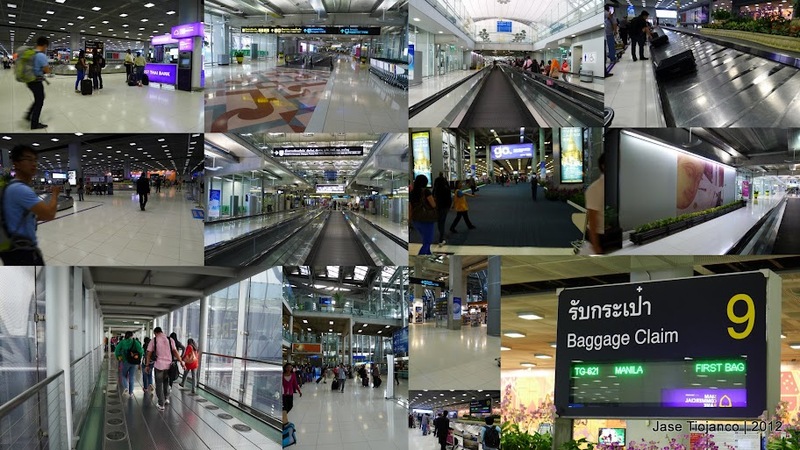 Suvarnabhumi Airport is light years ahead of Manila International Airport, well at least Terminal 1. Everything inside was bright and sparkly! The airport was glassy and had this nice, airy feel to it. They also managed to blend in Thai art inside the terminal, something that I hope they emulate here in the Philippines. Inside NAIA 3, the only ‘art‘ there is Ninoy Aquino’s bust. After going through immigration, I headed straight to the baggage claim area to get my luggage. Mine was the very first one! Haha. Sadly, my luggage’s lock was broken. Good thing none of my stuff got lost. I need a new lock! I looked for the exit where my hotel pick up would be waiting for me. Thankfully, the first exit I went through was the right one, I saw the hotel’s logo hanging on the rails along with other hotel logos. I can see Four Seasons! Yehey! I approached the lady near the Four Seasons logo and told her that I have a reservation. She asked my name then checked her list. Confirmed! After a quick phone call, my limousine was waiting outside. Inside the limo. S-Class Benz! Complimentary refreshments and mobile wi-fi inside the limo. Cool! Considering how far Suvarnabhumi is (roughly 25 kilometers) from the city center, I’m pretty impressed by how quick the travel time was to the hotel. In less than 40 minutes, I was already at Four Seasons Hotel and Resort. 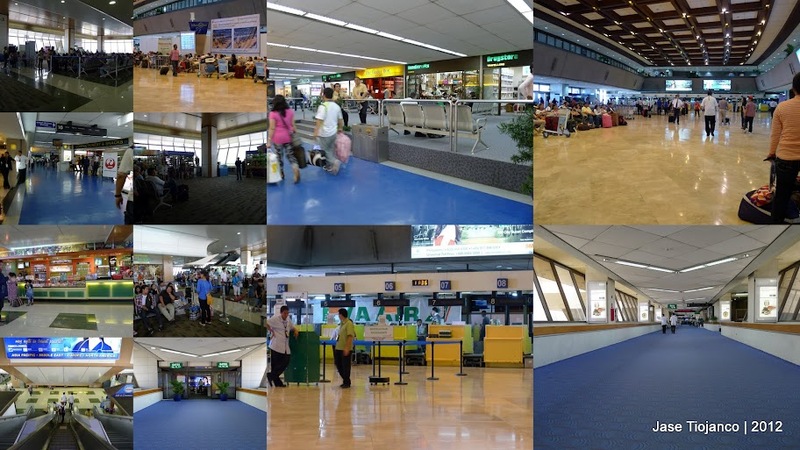 In Manila, it took me more than an hour to reach NAIA T1… and to think NAIA’s right inside Metro Manila. Four Seasons Hotel and Resort Bangkok. Thai hospitality was felt the moment I stepped into the hotel. Sawatdee kha, two ladies greeted. Checking in was quick, I simply showed my passport and they looked up my reservation. The receptionist gave me my key card and asked someone to assist me to my room. Before following the lady assisting me, I looked around the lobby. What a beautiful hotel, I thought. My room was on the fourth floor of the Monthathip wing of Four Seasons Hotel. Words could not express how elegant the hotel room was. The hotel deserves a separate post. My room at the Four Seasons Hotel Bangkok. As soon as the lady who assisted me left, I dropped my bags and jumped on to the bed. After more than 6 hours of travelling, I needed rest. Yeah, Thai food’s just fantastic! Also, if you’re looking for some fantastic R&R, Four Seasons Hotel Bangkok’s a great choice.